SAS artificial paper banana leaf is hygienic and eco friendly which can be used for in definite period and available round the year. 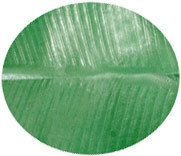 This artificial paper leaf is similar to the shape and shade to the natural plantain leaf with additional advantages. Dont Get Cheated By Buying A Duplicate Leaf , SAS & Co . Was The First To Mfrs. Paper Leaf In INDIA,Its Our Company's Innovative Product.We Are The Trade Mark And Patent Right Holder. CFTRI, Mysore has certified our product is "Highly Suitable for Packing and Serving Food"
CECRI ,Karaikudi has certified our product is " Eco Friendly & Bio Degradable "